Thanks hun!! Trophy Wife nail art designs are just so adorable! This reminded me of Spongebob when I first saw it. It's very cute! It's even hotter in Melbourne right now and I am totally melting! 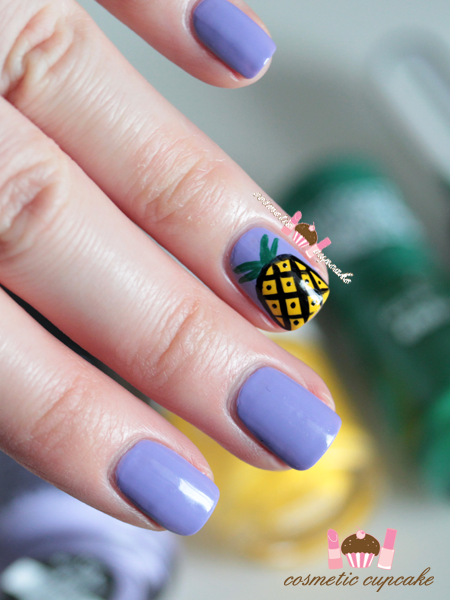 Love the pineapple so much, I have a few pineapples scattered throughout my house but have never thought to put them on my nails! so cuutee!! i love it! Pleaaaaaaaaaase do this on my nails one day! :))))))))))) I want a pineapple nail! Up to 38 degrees?!? I had to scrape ice off my car today...wanna swap places? Haha! Beautiful mani as always darlin, yay for fruity manis! I've seen this China Glaze Tart-y For The Party on many a blog & all I can think of is WHY do I not have this polish?! I will try to recreate your design when it's summer in Spain, ok?